At the Wizard’s Domain which is just above the Forest, you can exchange your gems and get items. There used to be a lot of items, but now only a few show up if you check in the “View Items” orb. 2012 Update: A bunch more items have been added and more are yet to be released. 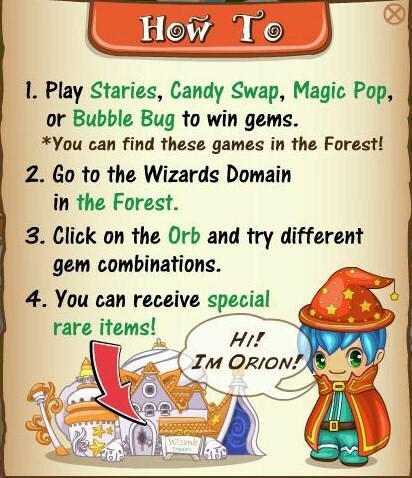 To get rare items(non-members) you need 2 sapphires and either a ruby or emerald. There are four different gem types:(from lowest to highest value) Sapphires, Rubies, Emeralds, Diamonds, Black Diamond, and Moonstones. Members can use whichever combination of gems and will still receive items(unless they already have them). You need to get 3000 points in Staries to earn a gem. And 10000 pts. to earn a gem in Candy Swap, I don’t play any other “gem” games. Update: These stats might have changed since ’10. *NEW* You can now buy Gems. You can buy them from little vending machines that look like the moodie ones in Wizard’s Domain, Uptown, and Downtown. How can I get certain gems? I think gems are given out randomly. I could be wrong, though so maybe try playing another game and getting a different high score. bliss~I’m pretty sure the items are randomized? there are gems that are for non-members and premium members. Non-Members can get rare member items to as long as it’s just rare. It says whether it’s rare very rare, etc , in the white chat bubble above Orion. If it says rare, then you should get a item; unless you’ve already gotten all the items.